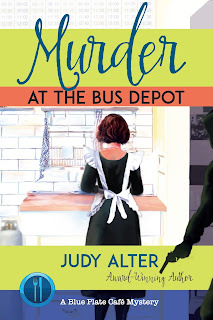 If mystery is your go to reading genre then you must check out Judy Alter’s series. Her characters are well developed, the setting feels like any town you may have visited or gone through at one time. There is enough mystery here to carry you through from beginning to end. The main character Kate Chambers operates a small café in the town of Wheeler, Texas. It is a town that is quaint but on the verge of losing some of it’s vital businesses. Enter Dallas developer Silas Fletcher. He wants to help revitalize the town starting with the old bus depot. The bus depot was the site of a 30 year old unsolved murder. Kate isn’t thrilled with Silas’ plans for the old depot so she tries to save it because of its historical significance. Enter another murder. Kate decides that if she is going to save her town and keep its quaint charm then she is going to have to find the murderer on the loose. This is the fourth book I have read by Judy Alter. However, this is the first one I have read of this series. It held up as a stand-alone book even though it was part of a series. However, now I need to go back and read the first three in the series. From the time I was small mysteries were my favorite genre. As an adult who teaches middle school, I am more in tune with middle school mysteries than adult mysteries. So, when I come across an author who writes wonderful adult mysteries I want to shout his/her name from the top of the world, or at least from my blog. Please pick up a copy of this wonderful book. You will find the characters as charming, and the mystery as engaging as I did. Many thanks for your kind words. Kate and I are delighted you like Wheeler so much.